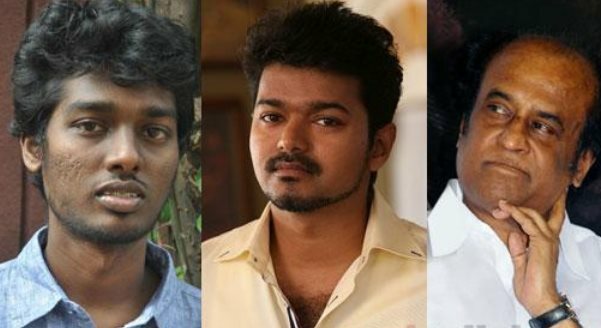 Vijay - Atlee film to start with Superstar Rajinikanth? Home » Atlee | Kalaipuli S Dhanu | Rajini | Samantha | Theri | Vijay » Vijay - Atlee film to start with Superstar Rajinikanth? Raja Rani Director Atlee is working on the script of Vijay’s 59th film. And its produced by Kalai Puli S Thanu, the film will go on the floors on June 26th at Kerala House – ECR, Chennai, with the movie launch function. Special information of this event is, Superstar Rajini has agreed to attend this function. Noteworthy Rajini’s next project with Director Pa. Ranjith is produced by Kalaipuli S Thanu. Atlee, the young filmmaker entered the Tamil Film Industry with a bang through his movie, ‘Raja Rani’. The film was well received by the critics and audiences, and it emerged as a blockbuster in the Box Office. Now, the young gun is gearing up with his new flick with Vijay. As per reports, the makers of the movie will be starting the works of this project from June 26th followed by a Pooja. Now, Atlee is trying hard to conduct the Pooja in Kerala Club House. The Pooja of Raja Rani was conducted in the same venue, and Atlee believes that starting the project here will bring some luck to the movie as well. Kamal Haasan inaugurated the Pooja event of Raja Rani, and this time, they are trying to rope the biggest star of Indian cinema to do the task. Kalaipuli S Thanu is now reportedly trying his best to bring Rajinikanth to the pooja event. Rajinikanth and Vijay has not met recently in any events, and if Rajini attends the event, then it will boost the publicity of the movie to a great extend. AJITH: MELLISA ORU KODU.. VIJAY FANS: VAYAI MOODUDA KIZHA BAADU !!!! List goes on, in their achievement and contribution to WORLD PEACE AND PROSPERITY.